Jewellery from the Victorian, Georgian and Edwardian period is often referred to as antique jewellery and is very collectable and unique. Antique jewellery can often be determined by it's style and/or type of gem stones. Diamonds were a favourite gem stone of the early Georgian period and memorial jewellery is typical of the Victorian period, also known as the Romantic Period. 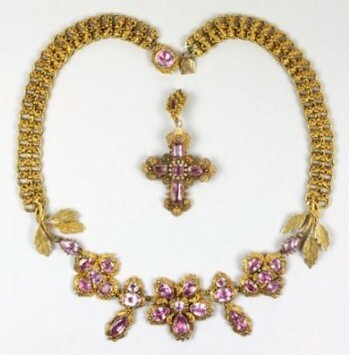 A Mid 19th Century Gold and Foiled Pink Topaz Necklace (FS18/238), which realised £3,600 in the Jewellery auction held within our Two Day April 2013 Fine Art Sale. The Edwardian era dovetailed with the French period, known as La Belle Epoque (the Beautiful Era) of the late 19th and early 20th centuries. The Belle Epoque period was known for it's high style of the privileged elite who indulged in its excesses. These two eras also overlapped the Art Nouveau movement of the same period. 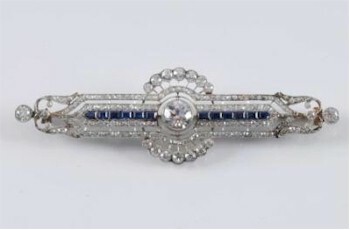 A belle epoque platinum, diamond and sapphire bar broach that is typical of the antique jewellery appearing regularly in our various jewellery auctions. Pearl jewellery is often in our jewellery auctions. Most common being that of cultured pearl necklaces and rings. Natural pearls are particularly sought after and reach the highest value at auction amongst all other pearl jewellery. Rare, antique jewellery can reach particularly high values at auction, especially if well made and in excellent condition. You can expect to find high end antique jewellery pieces in our quarterly Fine Art sales held in Exeter.